Pushing The Right Buttons: So what am I known for? Another in the Japanese style - well that's what happens when you get hooked on these Nicecrane Design images! This is from the Japanese Gardens set again. Oh and you may have noticed from my sidebar that Ignacio of Nicecrane Designs has kindly asked me to be on the Design Team! Another happy dance!! Some close ups now to show you more detail. I just had to make some more of that Japanese script background paper. I embossed the kraft glassine paper with the same Postcard folder used for the frame. And the mini sewing machine got another airing. Twice is enough for me - I'll be using my big machine in future. This is one of my silver Ferro embossing experiments onto which DI Peeled Paint and Stormy Sky were pounced. The image was clear embossed and the edges were painted with DS Brushed Cordruoy. The jade backing paper really needed a hint of distressing and black stamping. A bouquet of leaves kept this 'gender neutral' (there's another one for you Annie!! :) And finally some Ideology washers reminded me of those lucky coins you see on lots of Oriental projects. Lorraine (in Ontario) - the digital images are fantastic to use as you can print them onto whatever your printer will allow (including vellum, different types of card and printer-friendly fabric) and resize them. And they are already coloured for you so that makes it even quicker!! Patricia Howarth - think I am probably losing the plot lovely lady because I can't track down your blog/crafting showcase to reciprocate your kind comments. Please let me know where you are!! A fabulous mix of colour and texture Jenny, the bunch of leaves are a fabulous addition. Congrats on the DT position. A riot of embossing excitement - the Postcard frame looks brilliant with its Ferro texture, and your leaves are, as always, glorious! Oooh its lovely - I managed to stamp out a load of images yesterday, wet emboss them and then cut them out and ink them - now they are sitting in a pile on my dining room table - will see if inspiration strikes when I get back from the dentist at 10.00am this morning! yuck - have a nice day. This does look very you and it is a beautiful piece of art as always. Morning Jenny, OMG, I love this card, oriental is beautiful and elegant, I love the embossed ferro, I have ordered some and will definitely be giving this a go. Sorry, Jenny, I don't have a Blog, to be honest I don't know how you all have the time to do everything you do and still manage to Blog, but I so love getting inspiration from you to incorporate into my own cards, and I thank you for sharing your expertise. Your mixed creation is beautiful Jenny. Love the colors and your style too. Beautiful use of the imagery and once again Jenny it is the way you have handled the oriental theme. A stunning aged effect to it that looks so authentic. Buttons...this Japanese style piece is breathtaking. I love love all of the layers you've done on this. The Nicecrane Designs you used are really beautiful. I so love the background with all of the Japanese characters. 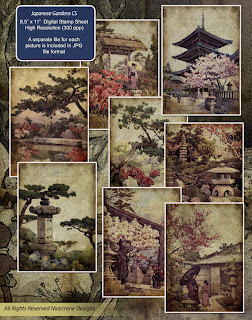 What a perfect background for your embossed and die cut frame focusing on that gorgeous Japanese scene. The embossed leaves and branch make such a lovely embellishment. I love the machine stitching. Who would think that could add so much? Love the bits of red ribbon and the 3 little washers on each side. Thanks for sharing your project and how you created it with us at Simon Says Stamp and Show. This was a hard one to actually think about our styles! I love your style! Love all the layers and texture and of course the embossing! Beautiful card! Hugs! Definitely a "Buttons Make". I think your style is lush, intense color and texture and always pushing the boundaries to try something new. It's always such in inspiration to come here and see what you have been up to. Congrats on joining the Nicecrane Designs DT. Can't wait to see more of what you can do with their images. This is just gorgeous. Love the embossed element and that gorgeous leaf cluster! Yes, I "know" you because of all the amazing artworks you show to us. Love what you create and enjoy it! Good luck with the challenge, Jenny! I know what you mean about asking the question about our style! I have no clue as far as I'm concerned but this wonderful piece just shrieks Jenny/Buttons to me! I love the layers to your work which create so much depth and your use of colour is another stand out factor for me. A gorgeous creation with many wonderful layers and great texture. Looks really fabulous. Sorry for the delay in reply Jenny,,, problems with my conmputer, LOVE THIS CARD,,,your ebossing is stunning, the vintage effect supberb,I love the unnusualo frame postcard,,,and the way you use my Japanese Garden pic,,, a Play of Art my friend,,,, you are rock. I totally agree...you are a fabulous embosser, and so much much much more! This is gorgeous! I love it! Just beautiful, and it's amazing that the washers take on an Asian coin look with this piece. I love the way you've jazzed up the Kraft Glassine and added so many special embellishments on this one. Another beauty! Gorgeous card! So many great details and the framing of the focal image is great. Thank you for sharing another awesome piece with us at Simon Says Stamp and Show!